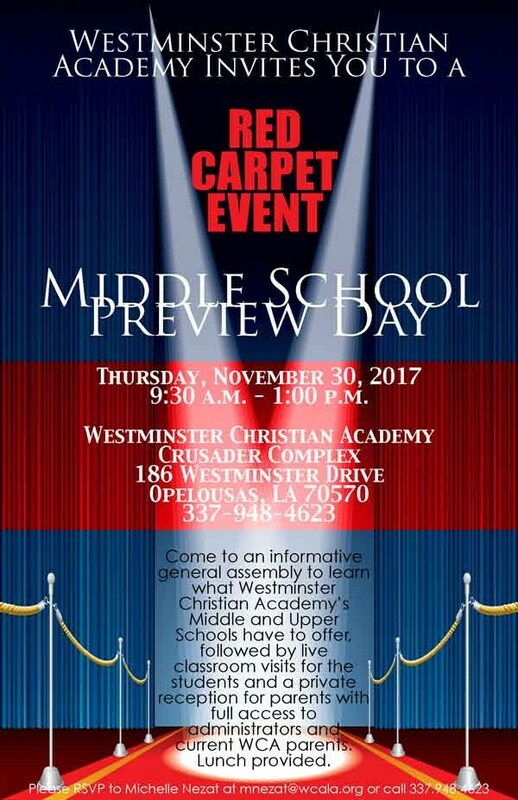 Middle School Preview Day is a free event for new prospective 7th and 8th grade students and their parents as well as our current WCA 6th grade students and their parents. The day includes presentations from various school groups, an introduction to athletics options available to middle school students, as well as student led tours of the campus to include classroom visits. The morning concludes with students eating pizza under the Upper School Pavilion while parents enjoy a catered parent reception with access to current parents and administrators to get all of their questions answered. Contact Michelle Nezat at 337.948.4623 or mnezat@wcala.org to get more information or register for this event.